Stocks got a boost Tuesday as new Fed chairwoman Janet Yellen stressed that monetary policy is unlikely to change much under her leadership. Investors clearly liked what they heard. The Dow rose over 190 points and briefly crossed the 16,000 mark for the first time since January 24. The S&P 500 and Nasdaq advanced more than 1%. The rally picked up steam during Yellen's question and answer session with lawmakers. 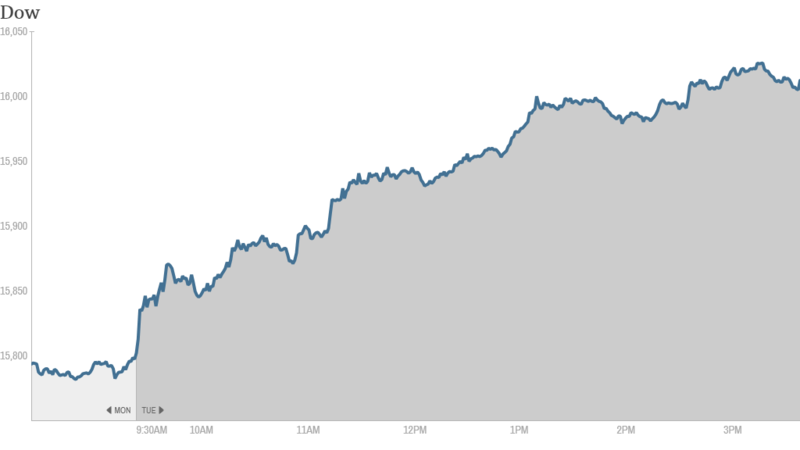 Tuesday marked the Dow's fourth straight up day. The blue chip index has clawed back from a few weeks ago, but is still down 3.5% this year. But thanks to Tuesday's rally, the S&P 500 is now less than 2% below its all-time high. And the Nasdaq inched into positive territory for 2014. Yellen testified before the House Financial Services Committee. It was her first appearance since taking the helm of the central bank earlier this month. Since January, the Fed has gradually been reducing the pace of that stimulus. After buying $85 billion in bonds per month since September 2012, the Fed said in December it would cut its purchases to $75 billion, and then trimmed the size of its quantitative easing program to $65 billion in January. While the Fed appeared on course last month to taper once again at its next meeting in March, two consecutive months of tepid jobs growth have caused investors to wonder what the Fed will do next. In prepared remarks, Yellen said the central bank plans to continue easing its stimulus program, a big driver of the 2013 stock market rally. She reiterated several times during the question and answer session that it would take a notable change in economic data for the Fed to change its plans. And investors seem to be taking comfort in Yellen's comments. CNNMoney's Fear & Greed Index, which tracks various gauges of market sentiment, has been sitting in Extreme Fear mode over the past few weeks. But it moved up to plain old Fear levels thanks to Tuesday's move higher in stocks. That could be a reflection of a new sense of calm in the markets after recent volatility. On the earnings front, Sprint (S) shares rose after the wireless carrier reported better-than-expected revenue and decent subscriber gains. The company posted a loss, but the losses narrowed from a year earlier. 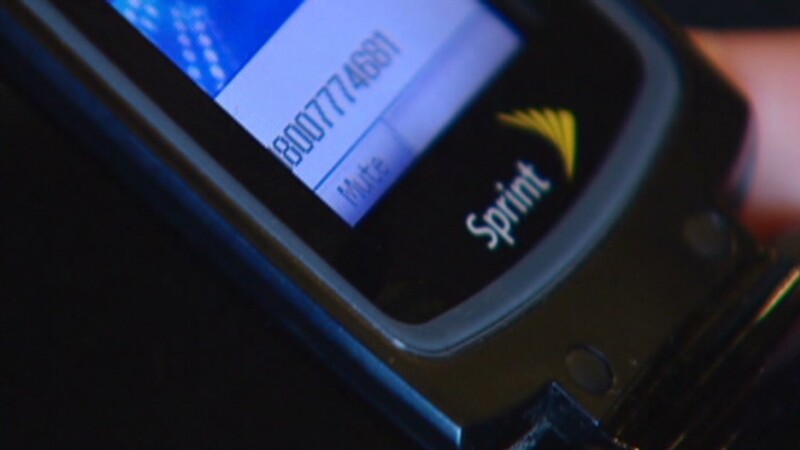 Sprint has reportedly been thinking of making a bid for its rival T-Mobile (TMUS). But there are doubts about whether a deal would pass regulatory muster. "Sprint's $S CEO declines specific comment in question about potential Sprint/T-Mobile $TMUS deal," noted StockTwits user FinancialJuice. CVS Caremark (CVS) shares gained after the drugstore chain reported quarterly increases in sales and profit. The company made waves last week when it announced it would soon stop selling cigarettes and other tobacco products. One trader noted that this could be a problem for the company going forward. "$CVS front-end comps down...cutting tobacco won't help that..." said StockTwits user retail_guru. Shares of cloud computing firm Rackspace Hosting tanked after CEO Lanham Napier said he would retire. Still, one trader was bullish given the long-term prospects for cloud technology. "$RAX...ridiculously inexpensive given that all storage and hosting will be cloud based in the future," said statspro. ConAgra Foods (CAG)shares plunged after the packaged foods company cut its full year earnings outlook. Another food company, milk producer Dean Foods (DF). also fell on weak guidance. Groupon (GRPN) shares took a dive on the news that a product management executive is leaving the daily deal site. But StockTwits trader extremelysmartguy didn't think the steep drop-off in share price was warranted. "$GRPN what an absolutely obvious, non-issue pre-earnings flush based on a nothing news item that will soon be forgotten," he said. Shares in British bank Barclays (BCS) fell in London after the firm reported a big fall in fourth quarter earnings and said it would cut up to 12,000 jobs. But Barclays also said it would give bigger bonuses to its investment bankers. European markets finished higher, while Asian markets closed with sizable gains.